Meg Griffiths was born in Bloomington, Indiana and raised in Houston, Texas. She received two B.A.’s at the University of Texas in Cultural Anthropology and English Literature and earned her Master of Fine Arts from Savannah College of Art and Design. She currently lives in Columbia, South Carolina where she is an adjunct professor of photography in the McMaster College of Art at the University of South Carolina. Her work has been shown in multiple venues around the United States including: Griffin Museum in Boston, 701 Center for Contemporary Art in Columbia, South Carolina, the Carte Blanche Gallery and the Rayko Gallery in San Francisco, and the Houston Center for Photography. She has also been published in Garden and Gun, South by Southeast Magazine, Southern Photography, PDN, Lenscratch, Le Journal de la Photographie, and Fraction Magazine. Her work has been added to several private collections and is part of the permanent collection at the Museum of Fine Arts, Houston. She was recently named one of PDN 30’s 2013: New and Emerging Photographers to watch. Ashley Kauschinger: What inspired you to create your series, Casa Particular? Meg Griffiths: A confluence of events led me to Cuba. Old photos and family stories of my grandparents’ time there just after marriage in 1946, the standard American preoccupation with a country that is off-limits, a very fortuitous decision in middle school to learn Spanish instead of French, and most importantly a drive to make connections through personal experience. My inspiration is driven by an amazing passage from an anthropologist and professor, Amelia Weinreb, where she describes, “that the real Cuba, Cubans tell you, happens behind closed doors, inside ordinary people’s homes, in their living rooms and kitchens. 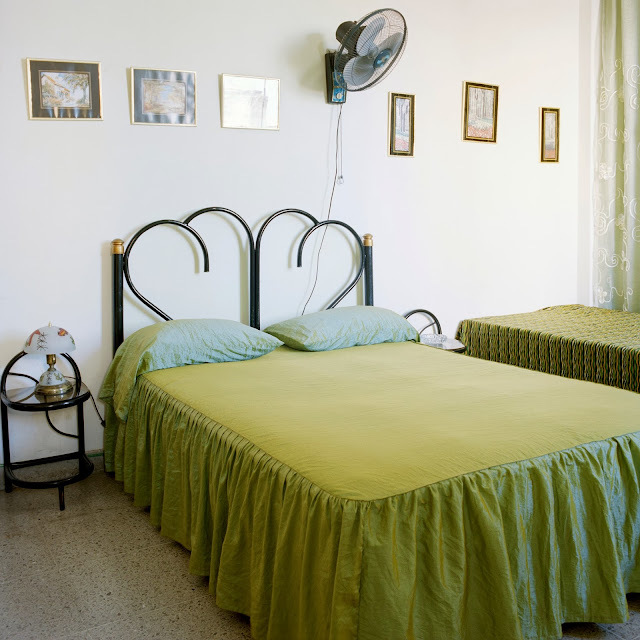 To gain any real sense of perspective of average citizens, one must go—as anywhere, but particularly in Cuba—into private space.” Having spent most of my photographic career up until that point making images of family and domestic spaces, the casa particular feels like a natural choice and part of my journey. 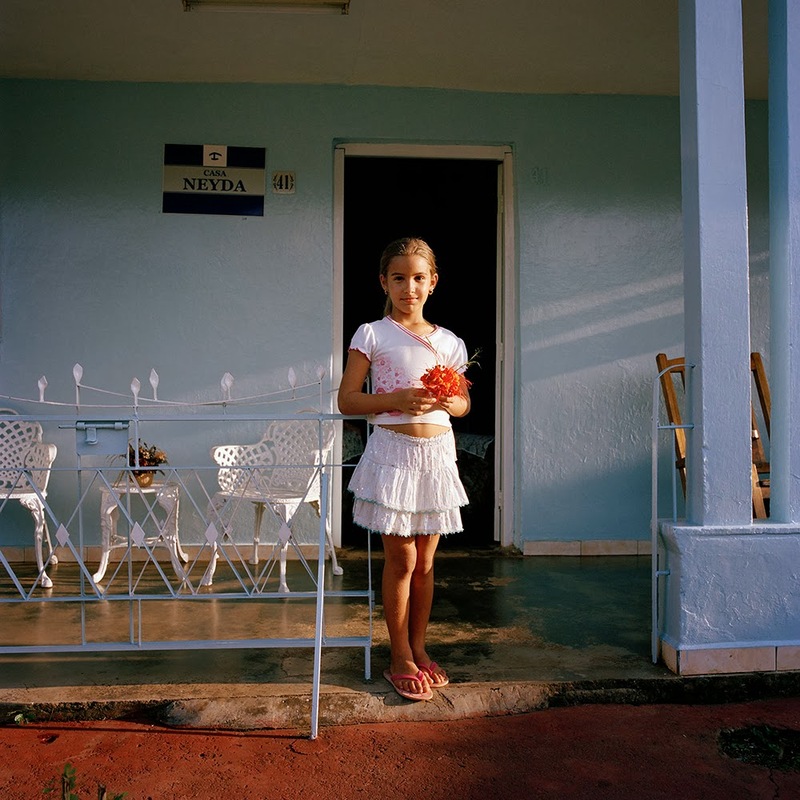 I knew I wanted to make images that added something new to the ongoing conversation concerning Cuba. I recognized that other talented and well-established photographers had come before me and I wanted to make sure that I did not tread upon that visual ground. I did my research, read as much as I could in terms of history, poetry, biographies, memoirs, and ethnographic accounts before I left. I reached out and made contacts with anyone and everyone I could think of, in order to establish a network and gain insight as to what I might expect while being there. I really felt that I could not begin to try and photograph, if I did not have a more holistic sense of what this place was about. AK: In your work, there is an interesting intersection of where private meets public. Do you feel like this connects to the act of photography? What are the subject's reactions to their public/private lives being shared publicly through your work? 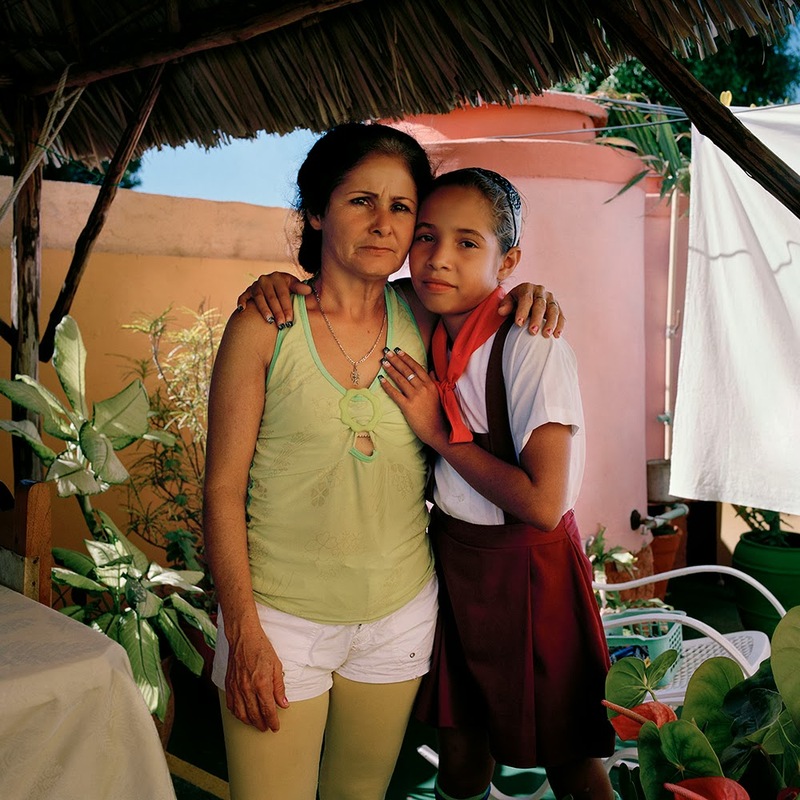 MG: This gets to the very heart of my project, the images I have made, and the ones I will continue to make in collaboration with these families in Cuba. Their lives are on public display due to the fact they open their homes to tourists, which inevitably forces a sense of formality in how they keep their homes and how they comport themselves. These are also, however, functioning spaces where they live and go about their daily routines. Photography acts much in the same way. Being both private in the sense that it is a personal and subjective experience, the act of choosing to single out certain areas of a home, a meal or a person you are connected to, but simultaneously it forces a kind of formality and creates a platform for observation, study and conversation. The project has been received with affection and fascination. I make it a point to bring back exhibition quality prints to everyone I have been fortunate enough to meet and stay with. I think most are very proud of how their homes translate into a print, the way the photograph changes how they see things within their own spaces. I believe everyone is genuinely intrigued how the photograph can turn something mundane, like the remnants of a meal, into something beautiful. 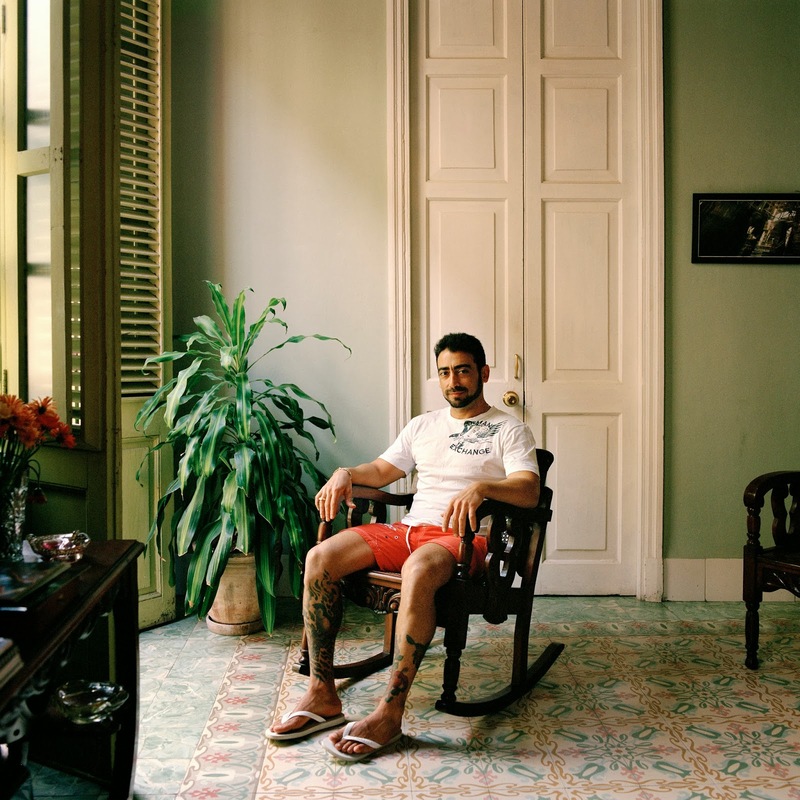 Many are touched by the portraits, which are hard to come by because there are not a lot of portrait studios or access to good quality printers, as well as interested in what the other casa owner’s look like and the way in which their counterparts homes are decorated. Many of the people I have lived with all know each other (there is a kind of casa network and they frequently recommend one another to their patrons), but few have actually met in person. It is exciting I think for these families to put faces to voices they have often spoke with over the phone, but never seen because travel is infrequent and expensive. AK: These images have a familiar feeling of home and family. 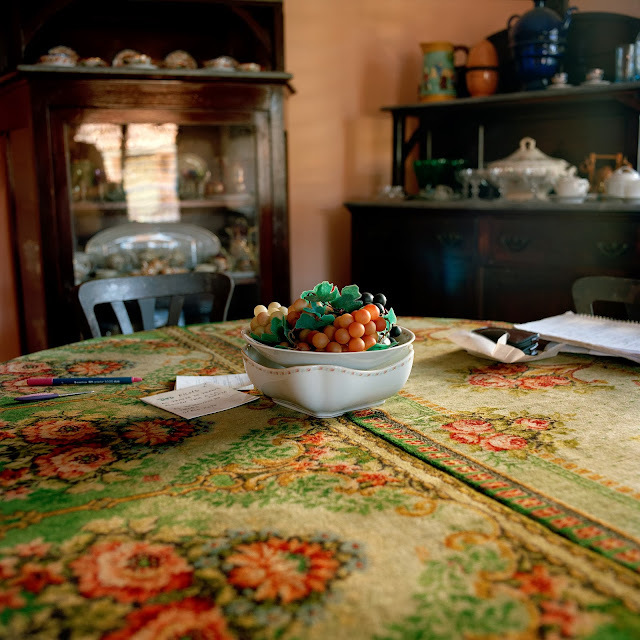 Titles such as "American Thanksgiving" and "After Nana's Breakfast" brings to mind a melding of cultures and families through the experience of these shared homes. What is your intention behind showing this? MG: I am very family-oriented. I love food and bringing people together inside my home. I feel like it is such a private space and an expression of who I am, and my work has always focused on these kinds of topics. It seemed like a very fluid transition to move from projects that were about my own familial experience to one that focused, in the same reverent way, on other families inside their spaces. The titles and images reflect a sense of transition and transference from my family to those in Cuba. My own very personal feelings of family and traditions mingle with the ones that I experienced within these homes. 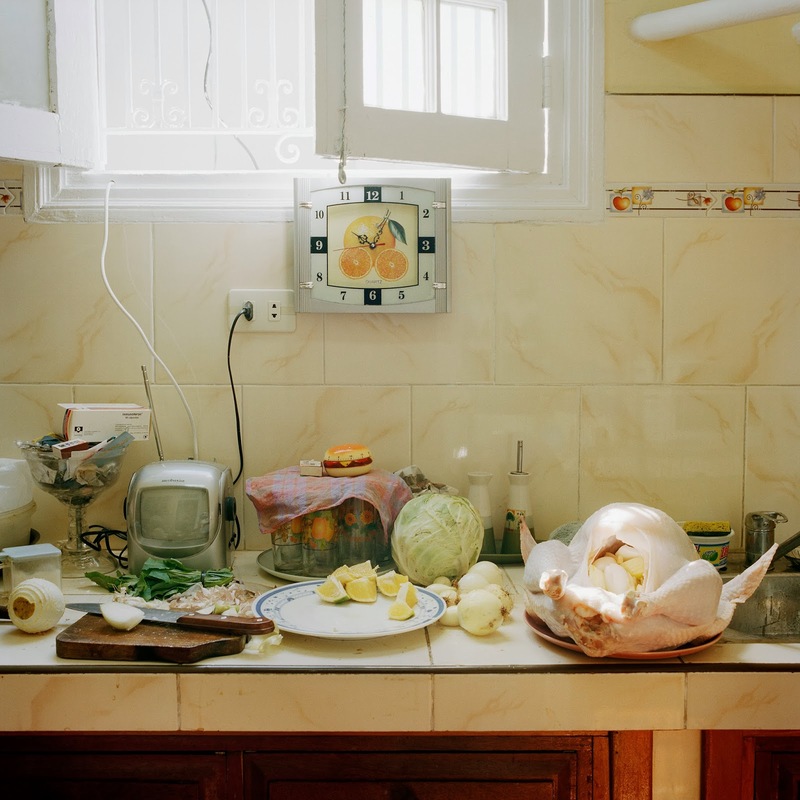 An image like “American Thanksgiving,” a tradition obviously not celebrated in Cuba, was my way of sharing one of my favorite holidays. It was the first I’d missed with my own family. It is a means of showing gratitude and love for a family that I had become close to while staying in Havana and about a shared experience conveyed through the images. AK: Do you think your education in Anthropology and English Literature influence how you approach photography? MG: I’ve adopted this saying from my mother that “there is no wasted energy.” Everything I have done up until this point has really made me the person and photographer that I am today, which is reflected in my work. Although I had been making pictures since I was thirteen, I often flirted with the romantic notion of being a writer. But I could not make up my mind as to what and how I would go about writing, which could have been much of my problem right there. I also fell in the love with cultural anthropology. I was attracted to the way ethnographers immerse themselves in different subcultures and seek to make connections between people, by means of observing customs, rituals, history, politics, economics and other social phenomena. Sounds a little nerdy, but those were the books in college I would stay up all night reading. I was fascinated and completely transported. I think my work lies somewhere between the novel and science, only I use a film camera instead of a pen to share those stories and experiences. AK: How do you go about balancing creating work, promoting it, teaching, and living life? MG: It is an ever-elusive concept, balance. I will constantly strive for it, but in this period I am making it a practice to be a bit more compassionate with myself when I cannot do it all at once. I think it is important to accept as certain areas of my life flow, then my work ebbs and vice versa. I may hit times where everything seems to level out but those are gifts that happen so rarely. I am trying to just enjoy the moment -- in my life and my career. I feel lucky that my work is very much about having life experiences, being open with people, and continuing to have amazing conversations about photography. I really can’t imagine doing anything else.